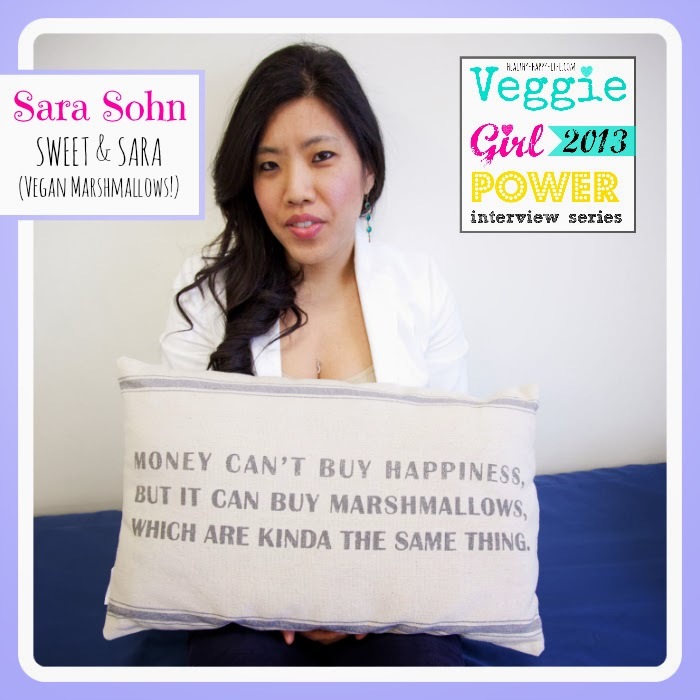 Next up in my summer-long 2013 Veggie Girl Power Interview Series is Sara Sohn, the lady behind the genius creation of Sweet & Sara Vegan Marshmallows - the original manufacturer of 100% gelatin-free, 100% vegetarian and vegan marshmallows. Sara's Company. 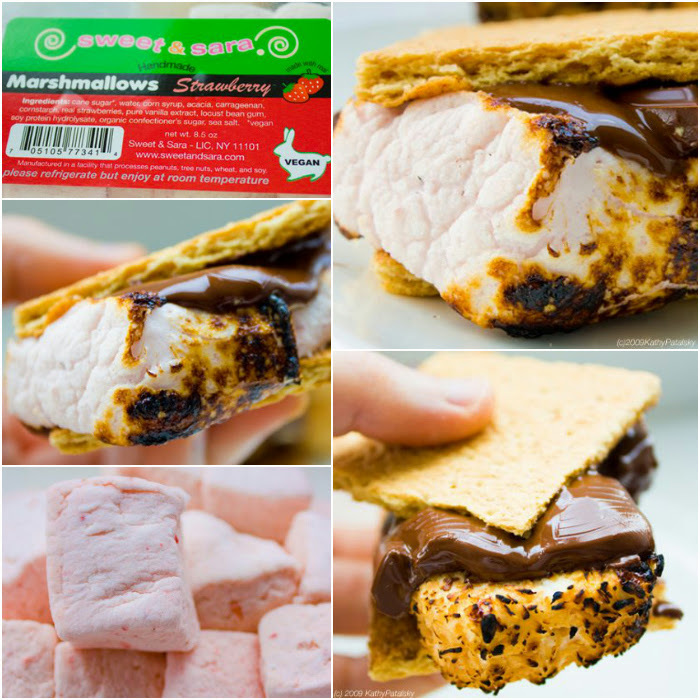 The vegan marshmallow company Sweet & Sara, was founded by Sara Sohn in 2005. The recipe for vegan marshmallows took over 10 months to produce. Instead of using gelatin in the recipe (which is not a vegan ingredient and a standard ingredient in all mainstream marshmallows) Sara uses seaweed to produce that same marshmallow texture! Sweet & Sara has been featured all over the media including Food Network, VegNews Magazine, Rachael Ray, Martha Stewart and more. Where to Buy Sweet & Sara Marshmallows? You can buy these amazing gourmet marshmallows at various Whole Foods stores around the country and several other store locations. Or online! My First Taste. The first time I tried Sara's marshmallows I was in heaven. I picked up a container of the strawberry flavor and bit into the fluffy square confection. Bliss! Like biting into a pink strawberry cloud with vegan sugar on top. Unlike most marshmallows, you really can eat these all on their own and the flavor, texture and design holds up as a singular amazing dessert treat. See the strawberry smores I made using Sara's marshmallows. Gourmet, vegan, amazing. The recipe ideas are endless. Smores, rice crispy treats, hot cocoa with marshmallows and on and on. Lets get to know Sara! Sara: When I was 13, I fell madly in love… with Skipper, my pet bunny, and never imagined in a million years that such a tiny creature would have such a huge impact on my life. One day a woman had the gall to ask me if I would ever eat my rabbit and when I responded, “Of course not!”, she proceeded to ask me why then did I eat cows, pigs and chickens. From feeling immediately insulted, I felt instantly ashamed. I didn’t have a good answer. It was the very next day that I became a vegetarian and a year later I became vegan. 22 years later, I’ve never looked back and it’s still one of the best decisions I’ve made in my life. Sara: To those starting out, strive for progress not perfection. People tend to give up too soon because they think about how far they still have to go instead of how far they’ve come. 22 years ago, it was tough being vegan. The only “treats” available were carob bars, brown soy milk, and sunshine burgers and one had to trek to specialty stores to get these. Two decades later times have really changed –you can find all your favorite foods veganized and not only that, you can find them in most supermarkets! With so many options and such accessibility, eating vegan has never been more easy and delicious and fun. Sara: Being in NYC, vegan mecca, I am so lucky and spoiled to have some of the most incredible eats here! Some places have had my heart since day one. Candle79: seitan picatta and chimichurris will win over any meat eater. Lan Café (vegan Vietnamese): #31 and #36, you’ll thank me. Lula’s Sweet Apothecary (vegan ice cream): I’ll take a scoop of each flavor please. Cinnamon Snail (vegan food truck): some of the most creative food I’ve had, Chef Adam is a genius. Dunwell Doughnuts: vegan doughnuts…need I say more? Franchia (vegan Korean)– corn chowder, sweet & sour mushrooms, and citron tea frap with whip, thank you! The days I am not in a hairnet and apron, I am thankful for Mooshoes (vegan shoes + accessories), OCC (vegan makeup shop), and Vaute Couture (vegan clothing line). Sara: Monday-Thursday I generally try to eat healthy. I start the morning with a soy latte and an analogue meat (right now it’s Beyond Meat chicken strips straight out of the box). For lunch it will be greens, beans, and fresh carrot, apple, kale juice. For dinner, it’s a Vega protein shake and raw almonds. I snack on kale chips with nutritional yeast that I bake 3 times a week, it’s my current addiction. Fridays are my no holds barred, get out the spandex pants, pure gluttony days where I get a break from the marshmallow factory and take a jaunt into the city and hit my favorite vegan spots. Sara: Veganism is the future, and has profound, far-reaching positive effects on the animals, the environment, and our health that can’t be ignored and we have the power to change the world for the better, simply by changing what's on our plate. Sara: Tofurky - one of my favorite companies, not only because the products are just straight up deliciously awesome, but this company is a game changer, an innovator, and always thinking outside the box. I die for hickory smoked deli slices! Tofutti – I will always have love for them. They were there for me 20 years ago when no one else was and I still think their cream cheese rules. Daiya – pizza was the hardest thing for me to give up when I went vegan so when I discovered this cheese I literally wept tears of joy. Need to meet to the creator. Recently discovered Thug Kitchen, this blog keeps it real with humor and hella good vegan recipes! He speaks to me. I also love Mimi Clark of Veggie Gourmet, a passionate, knowledgeable vegan cooking instructor dedicated to teaching others how to create mouthwatering meals. I turn to her the few times I actually cook meals. Sara: My mission in life is to get people to eat less animals and more vegan and I feel that can’t be accomplished if we are too preachy about our ethics. People ask me all the time what we had to do to get Sweet & Sara into Whole Foods and Duane Reade or how we got on Food Network and Cooking Channel. My answer has always been, I let the product speak for itself. One of the most surprising yet pleasant discoveries about Sweet & Sara is that while we cater to vegetarians and vegans, we have a large customer base that is neither vegetarian nor vegan. Non vegans tell us all the time that they honestly think our marshmallows far surpass the gelatin laden ones and they’re so good they can’t believe it’s animal free. I always say it’s important that we vegans lead by example, inspire by example, and we need to educate not intimidate or alienate. Sara: We’re coming out with some new, heavenly products but at the moment they’re in the fine tuning stages, so stay tuned! We’re also working on getting into more mainstream chain stores so our scrumptious vegan marshmallow treats can be accessible to everyone! Sara: Throw in strawberries, mangos, pineapples, bananas, and coconut-almond milk into a blender and you’ve got my favorite smoothie. Pretty simple to make and nothing extraordinary but always so good. My dad loves it so much he wanted me to name the business, Sweet & Smoothie, ha! Sara: Plant based eating is definitely the diet of the future. We can’t afford to turn a blind eye to the ethical issues, environmental impact, and health problems associated with consuming animal products.